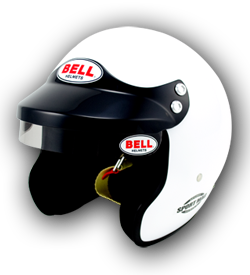 Full Line of Bell Helmets and Accessories. 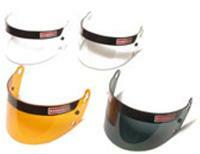 The Sport helmet offers full face protection and a standard size eyeport. All Sport Series helmets feature classic Bell design styling, comfortable interior and a lightweight composite shell. The Sport helmet takes a 281 SRV Shield and each helmet comes with a clear shield and Bell visor strip as standard equipment. The Snell SA2015 rated Sport helmet is designed for the sportsman or entry level racer who demands value and quality at an affordable price. 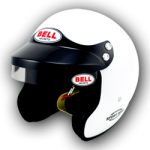 Racers can customize the fit of the Sport by using Bell’s Cheek Pad Inserts in 5mm, 10mm, 15mm and 20mm sizes to tighten the fit in the cheek area. 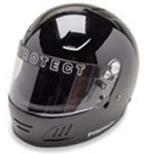 The Sport is pre-drilled for use with head and neck restraint devices. The Bell tradition of building high quality open face helmets with classic styling lives on in the Sport Mag. 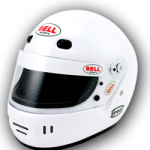 The Snell SA2015 rated Sport Mag helmet is designed for racers who enjoy the feel of an open face helmet and demand value and quality at an affordable price. The Sport Mag helmet offers advanced protection and a visor peak with sun screen to help shield the eyes from excess sunlight. 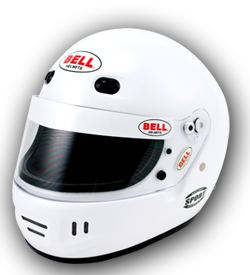 All Sport Mag helmets feature classic Bell open face styling, comfortable interior and a lightweight composite shell.The Sport Mag is pre-drilled for use with head and neck restraint devices..
Removable interior for cleaning or replacing. .125″ Polycarbonate shield with tear off post. Replaceable cheek pads are available in Thin, Standard and Thick. Uses Bell style tear offs. Large eye ports on full face models will accommodate eyewear. Compatible for most aftermarket safety restraint devices. Fire retardant high gloss finish. 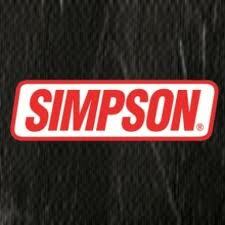 We offer all Simpson helmets. Click on the Helmet to view their line up of helmets. Measure directly above the brow line for the best helmet fit. HELMET FIT: A correctly fitted helmet should feel like an even amount of pressure is being exerted around your head and cheeks. But, helmets break in, so it should fit as tight as you can comfortably wear it. Once fastened, you should NOT be able to pull it off your head in any direction. Attention first-time helmet buyers: If your helmet is loose at all, and doesn’t fit well, it CANNOT deliver the best protection. A helmet’s strict safety standards can be compromised after only one impact collision. If the integrity is in question, send it back to us for proper inspection. If you have a more narrow head shape you may need to go a size smaller. If you have a hard time getting a helmet to fit properly, go to a motorcycle shop that sells Shoei helmets to test fit a helmet. If not available we can send one for a test fit.NOTE: SRP also recommends inspection of your helmet after any impact collision.